Distribution and habitat: Agave americana is a unique succulent plant native to Mexico. These are large plants with loose, open, trunkless rosettes. The grey-green leaves will reach up to 2m (6 feet) in length and 25cm (10 inch) wide with marginal hooked spines. Tips of leaves have a very sharp spine reaching up to 5cm (2 inch) long. 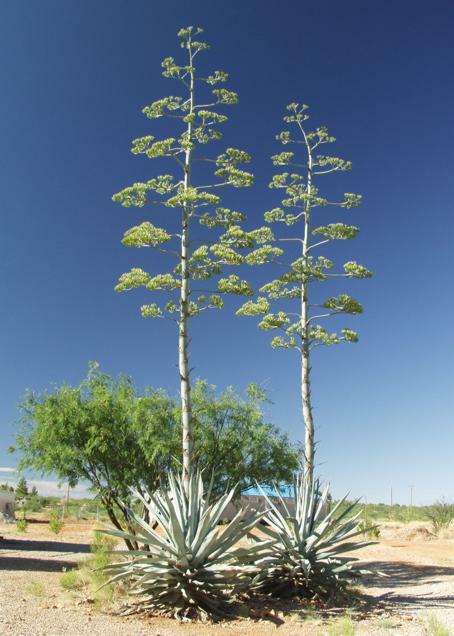 They received the name Century plant because it was believed that they flowered every hundred years. In fact, most plants will bloom in 10 to 30 years, but a lot less than 100 years. Blooming: Flower stalks can reach from 4.5-12m (15-40 feet) tall. The greenish yellow flowers are up to 9cm (3.5 inch) long. 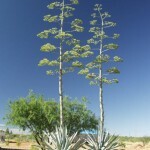 Agave americana dies after flowering, but produces suckers or adventitious shoots from the base, which continue its growth. 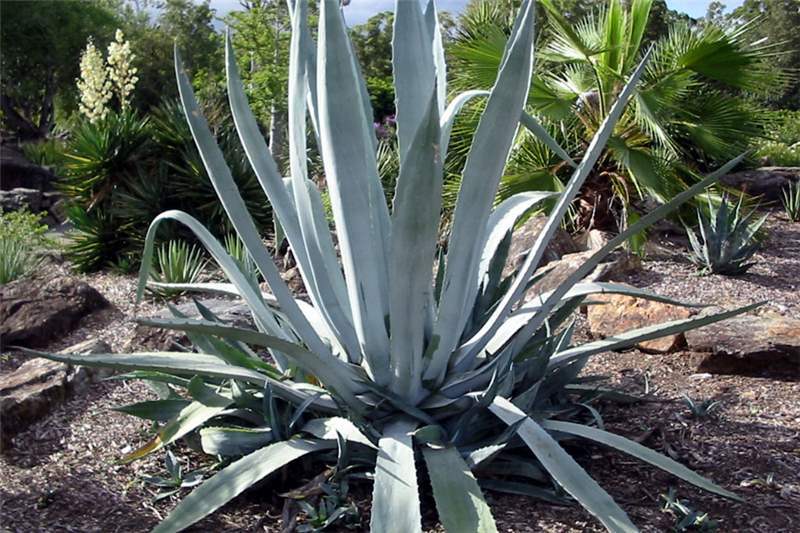 Lifespan: The average lifespan of Agave americana is around 10 years. Description: Agave americana grows so big that can be used indoors only when is quite young. The leaves of a fully grown plant may exceed 2m (6feet) in length. Without an obvious stem, it forms an open rosette of blue-green, spiny-edged leaves, each tipped with dark brown needle-sharp point 5cm (2 inch) long. Houseplant care: Agave americana is a very easy to grow plant. It is a slow growing plant and ought to be abandoned for the pot culture when they reach 61cm (24 inch) across. By this time they will have produced many offshoots which can be potted up and started again over and over. Agave americana will not bloom in a pot. The sharp spine at the tip of its toothed leaves is often removed to protect people and pets. Locate it at least six feet away from walks and other areas where people could contact the spiny foliage. Light: Agave americana grows well in a well-lit position, such as a sunny windowsill. If the plant was the subject of some shade, it should be acclimatized to full sunlight gradually. Move such plants to full sunlight over the period of a week or two. A sudden change in light intensity can burn the foliage. 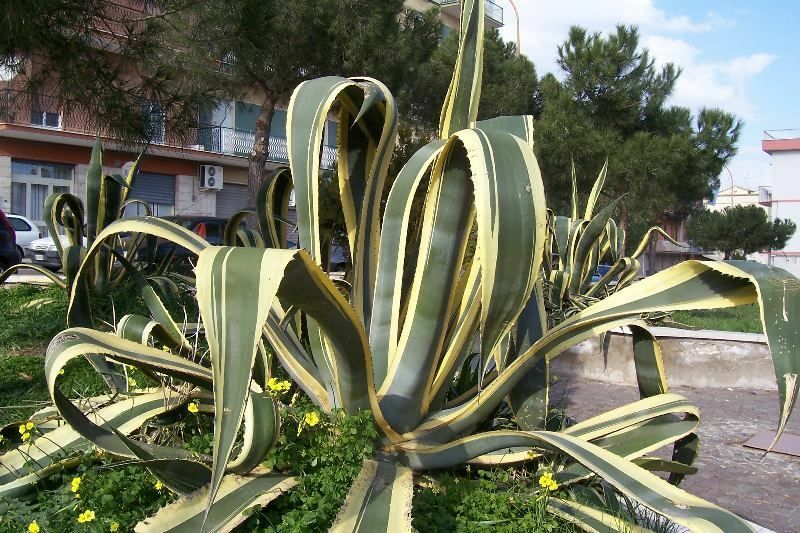 Teperature: Agave americana likes warm temperatures in summer and cooler in winter with a minimum of 10°C (50°F). 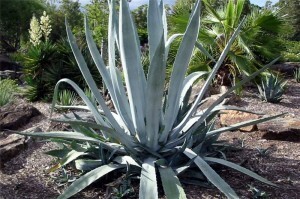 Normal room temperature is great for Agave americana during the growth period. 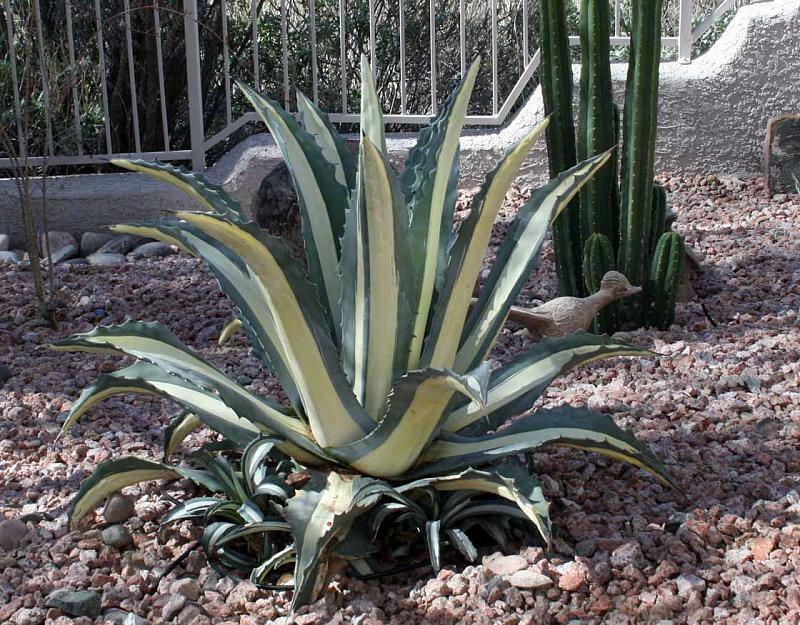 Water: Agave americana needs more moisture that most other succulents in the growing period. Water well during the active growing period – enough to make the potting mixture thoroughly moist, but allow the top two-thirds of the potting mixture to dry between waterings. During the rest period water the plant very sparingly only enough to keep the potting mixture from completely drying out. A layer of fine gravel on the surface of the soil will prevent water from accumulating around the plant and causing the base rot. Fertilise: Apply standard liquid fertiliser every two weeks during the active growing period. Do not fertilise the plant during the resting period. Potting and repotting: Use a soil based potting mixture with an addition of one-third coarse sand or perlite for good drainage. Agave americana should be repotted every spring into a pot one size larger. Put a layer of broken crocks in the based on the pot to ensure good drainage. Plants that have been reached the maximum convenient pot size should be top-dressed in spring. Culture: When gown outdoors, Agave americana need full sun and well drained soil mix consisting of equal parts of loam and sand. The plants are very drought resistant. Water them and allowed to dry thoroughly before watering again. They are fertilized only once during the growing season with a balanced fertilizer. Propagation: Agave americana is propagated by using offsets, which often are found growing around the base of the plant. Detach one offset when is 8-10cm long and root it in a standard potting mixture. Until the offset is well rooted, water it only enough to make the potting mixture barely moist. Rotting at the base and wilting of the leaves indicate overwatering or poor drainage. Hard dry brown spots on the leaves may be caused by insufficient water during the growing season. 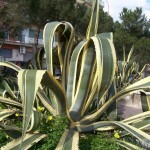 Agave americana ‘Marginata’ (Variegated Century Plant) is an variegated form with yellow edged grey-green leaves. Agave americana ‘Medio-picta’ is an variegated form of Agave americana with a central band of yellow bordered with green. 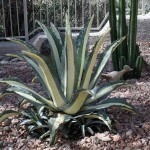 Uses: Agave americana is hardy enough for the most exposed courtyard or balcony. Agave americana makes a dramatic statement in the landscape and is much favored for use in rock gardens. In many gardens Agave americana is best grown in containers. The gigantic leaf-rosettes of these splendid succulents rank them among the most popular accent plants for modern gardens. Note: Be sure to wear heavy gloves when working with thorny Agave americana. Keep the plants well out of the reach of children.